This bowl is made from hand pulled orange and red canes, which is a two-stage time consuming process. First Nicolaus hand pulled the canes, then he made the bowl with those canes. 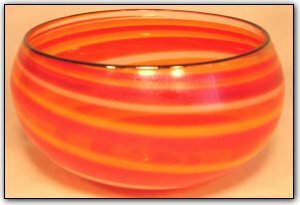 This bowl also features a black lipwrap, adding stunning contrast to the beautiful colors of red and orange as they swirl together in the center.